Bars, bartenders and imbibing in Beantown. 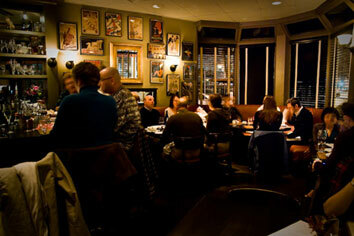 Atmosphere: A bustling, convivial bistro bar whose combination of cocktails, dining and service is unmatched in the Boston area. 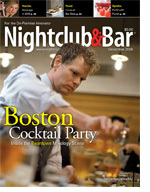 See Best Boston bars for address and contact info. I rejoiced when I first heard that top chef Tony Maws was moving his Craigie Street Bistrot, just outside Harvard Square, to a larger site in Cambridge that would accommodate a full bar, and, more importantly, that that bar would be overseen by one Tom Schlesinger-Guidelli. Opened in late 2008, Craigie on Main (853 Main St., site of the former La Groceria in Central Square) answers the prayers of anyone who loves great restaurants but prefers the atmosphere of a bar to that of a dining room. At the new place, Maws’ culinary excellence and creativity are aided and abetted by Schlesinger-Guidelli’s talents as a mixologist and barman. The two men make a formidable team. S-G, who developed an effortless (but disciplined) creativity during his time at Eastern Standard, is given free reign to practice his craft to the hilt. In addition to stocking quality spirits and using Kold-Draft ice, he makes many ingredients from scratch, such as a Carpano Antica replica for a Martinez or an amber vermouth for his own Camino Cocktail (amber vermouth, Rittenhouse rye, myrtle berry liqueur). He also looks to the kitchen for inspiration, pillaging herbs and other produce or bruléeing a sugar-coated tangerine before muddling it into a tequila-based drink. All the while, he mentors a young bar staff, passing on that combination of old-school expertise and understated good humor that distinguishes the best contemporary Boston bars. The bar area consists of a dozen or so stools, plus a few café tables. Warm lighting, retro posters and lots of windows counteract my yearning for an interior with a little more soul. While the dinner menu is expensive enough to put Craigie on Main into the “special occasion” category, the food is fairly priced for the quality. Luckily, there’s a bar menu for those wanting a more casual bite, and the drink prices are on par with other quality Cambridge restaurants: $9-$11 for cocktails, $4-$10 for beers (mostly craft and import) and $9 and up for wines by the glass. After a period of uncertainty about what exactly was happening with the bar formerly known as the B-Side Lounge, there appears to be confirmation of previous news that Daniel Lanigan (proprietor of the Moan and Dove in Amherst and the Dirty Truth in Northampton) will open a new beer and cocktail bar in that space. This is terrific news! Congratulations, Daniel, and good luck muddling through the bureaucratic fun that has to happen before you open. 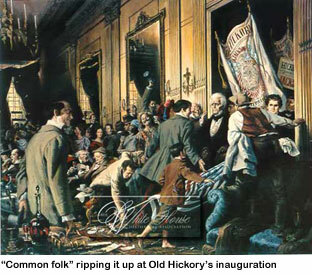 Come toast BHO … and Old Hickory, FDR & JFK! I know, the invitations to inauguration parties are piling up in your Facebook inbox. But will those parties take place at one of Boston’s best bars — Green Street — and feature a historic coming-together of presidential cocktails, specially brewed inaugural beers and a champagne toast? I think not. So gather all your friends and bring them to Central Square on the night of Barack Obama’s inauguration, January 20. In the spirit of bi-partisan cooperation, Drinkboston will represent the cocktail community in co-hosting a celebration with the folks behind the world’s largest online beer community, BeerAdvocate. The wine wing of our commonwealth will also be represented; Tyler Balliet, who writes the Second Glass wine column in the Weekly Dig, will construct a champagne tower. Imagine: cocktail drinkers, beer drinkers, wine drinkers — even independents — in the same room, clinking glasses in honor of a new president and doing our part to move the country (or at least our psyches) in a new direction. Check out the cocktail menu — it’s historically relevant and tasty. This is a ticket-less, free-form party. Just show up and get your Hail to the Chief on. The kitchen’ll put out some killer free snax (homemade chips & dip, spiced nuts, etc. ), plus really good tacos for $4 each. Festivities begin at 5:00 p.m. and end at last call. Hope to see you there! Ever wonder how the Boston mixology scene — the constellation of bars and bartenders who take drink-mixing seriously and are chronicled regularly on this site — came about? Who the originators and other key figures are? What they think of their collective work and its future? Well, you’re in luck, because I lay it all out in a recent cover story for the trade publication Nightclub & Bar. (Yes, that’s Drink‘s own John Gertsen on the cover.) Here’s to all the cocktailians in this city who are helping the scene to thrive! Boston bartender Misty Kalkofen recently became one of the few bartenders in the country to be certified by the Beverage Alcohol Resource (BAR). If you’re not in the hospitality industry, you can be forgiven for not knowing what a huge deal that is. Think of it as being named a Rhodes Scholar or a MacArthur Fellow for your work with a shaker and your deep understanding of spirits, cocktail culture and history. It takes a lot of training, serious study and the ability to pass a gut-wrenching examination with both lab work and written exercises. The credential is relatively new. While wine professionals have been able to pursue Master Sommelier diplomas for decades, and chefs their culinary-school degrees for centuries, bartenders have had little to prove their skills other than their following. That changed in 2006, when a group of the industry’s brightest luminaries founded the BAR in New York City to train and certify cocktail professionals. Its faculty features some of the heaviest hitters in the business, including F. Paul Pacult, editor of Spirit Journal; Dale DeGroff, famed mixologist and founder of the Museum of the American Cocktail; Steven Olson, noted wine and spirits writer and educator; Doug Frost, a rare Master Sommelier and Master of Wine; David Wondrich, famed cocktail historian and correspondent for Esquire, and Andy Seymour of aka wine geek. Ms. Kalkofen took the BAR’s five-day Intermediate course (tuition: $3,500), and by passing the grueling exam received the greater of the two levels of certification, BAR-Ready, which recognizes professional-level bartending skills in high-intensity environments, plus broad knowledge of the culture, history and makeup of spirits and cocktails. (The lesser credential, BAR-Certified, requires more modest bartending skills.) 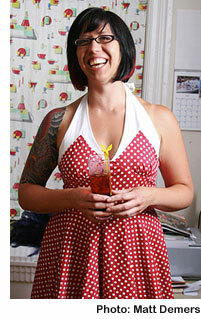 Her resume already reads like a greatest hits of serious Boston bars: she’s currently at Drink, Boston’s newest temple to Golden Age cocktails (her Drink colleague Josey Packard is the only other Boston bartender to be BAR-certified); she previously managed the bar at Green Street, another of Boston’s three or four best; and she’d worked a long stint at the bygone B-Side Lounge, the birthplace of Boston’s cocktail revival. I sat down with her to ask her about her work and her experience with the BAR exam. MC Slim JB: Was the B-Side your first stint behind the bar? Misty Kalkofen: Nope. My first bar gig was at the Lizard Lounge. That is also where I met Brother Cleve, who was instrumental in starting me down the road of cocktail lover/historian/geek! He did a weekly DJ night called Saturnalia, and each week he would teach me a classic cocktail recipe. After two years of Thursday nights, I had this nice catalog of delicious classic recipes in my noggin, and I was hooked! MC: So what was your motivation for taking the BAR exam? Professional pride? Bragging rights with your peers? Career opportunities? MK: I’d heard a lot about the BAR and had been interested in it for a while. Obviously, all one needs to do is read the bios of the instructors to realize that you will learn soooo much. And in any profession, if you stop learning, you stop growing, and the rest of the industry will pass you by. So the educational side was a huge draw for me. Also, I knew I would meet folks from all over the country who are interested in the same things I am. I love having people to talk to about ideas and trends, so the more bartenders and brand ambassadors I can meet the better! MC: Tell me about the exam. I’ve heard it’s more stressful than the SATs and GREs combined. What are the different components? MK: The exam consists of three parts. In the practical phase, they set up a faux bar situation in the kitchen of the Astor Center and took us in six at a time to make drinks. We were evaluated by two people: one instructor and one BAR graduate. They approached us as guests and started ordering drinks. We had to make six drinks, and were evaluated on technique, knowledge and our ability to make the drinks correctly and deliciously in the allotted time. Part two was the tasting phase. First, we had to blind-taste two variations of the same cocktail and compare them. The point wasn’t to name the drink, but to contrast the two, saying which was more balanced and why. Next, we had to blind-taste six spirits. For each we filled out an evaluation sheet on which we had to list all the aspects of the spirit’s taste, both generally and specifically. For example, I would mark the box for “tropical fruits,” but I would then need to write down which specific tropical fruits, e.g., coconut or banana. We assessed for fruit, non-fruit (flowers, herbs, spices, vegetables), wood and aging — for example, what notes (such as butterscotch or pepper) hint at barrel aging, what type of wood the spirit was aged in and for how long. We were also asked to estimate proof and to evaluate cleanliness, balance, oak integration, length of finish, complexity and quality. Finally, we had to identify what the spirit was made from, where, and what category it falls into. You could get extra credit for naming brands, a specific region of origin, etc. Part three was a written exam: about a hundred true/false, multiple choice, short answer and essay questions. Then I had to critique a cocktail menu. MC: Yikes! So, what drinks did you have to make? MK: Four were from a list of the most important/common drinks from the manual that we’d been studying. For number five, I had to buy a spirit from Astor Wine and Spirits, make an infusion from it, and then create a cocktail based on the infusion. It could be something I’d worked with before or something new — it was up to me. The final cocktail was my choice. I made my evaluators (Don Lee of New York’s high-craft speakeasy PDT and Willy Shine of the BAR) a Hearst for my chosen cocktail. Interestingly enough, on the night before the exam, at a dinner in Chinatown, I predicted that Don Lee would be one of my evaluators and that I would make him a Hearst. Perhaps I missed my true calling: fortune teller! MC: How cool! I’m dying to get to PDT. Do you remember the spirits in the blind tasting? MK: Well, an answer to that would be pure speculation, as we never get a corrected copy of our exam back. The interesting thing about the blind tasting is that you could evaluate a spirit correctly as far as taste descriptors and aging evaluations were concerned and receive many points, while still arriving at the wrong conclusion as far as a spirit family was concerned. MC: Sounds like my college topology course. What was the scariest part of the exam? MK: Hmmm … well, making drinks in the practical phase was nerve-wracking because the setup was unfamiliar, and I was making drinks for two people that I have the utmost respect for in this field. But I was most nervous about the blind tasting. Even in an unfamiliar situation I feel confident in my mixing skills, but the finer points of tasting were new to me. Many of the other folks in the course had amazing palates and also had more background in the proper way to taste spirits, so the group tastings could be a bit intimidating and overwhelming. MC: You’re a well-educated person: you’ve taken your share of other standardized tests. Were you one of those kids that slayed the SATs? Do you remember your scores? MC: Baloney! You’re just being modest, Ms. Smarty-Pants! So, did you come out of the BAR exam thinking, “Pish, I nailed it,” or were you on tenterhooks waiting for the envelope to deliver your fate? MK: I didn’t breathe for weeks. I was so frickin’ nervous. Even after I found out I passed I didn’t believe it. MC: How did you celebrate? MK: I drank a couple big bowls of punch with the ladies of LUPEC [Ladies United for the Preservation of Endangered Cocktails] and our great supporters at Grand at the first LUPEC punch party! MC: I’ve seen the photos; that one looked like a lulu! Is there a diploma on your wall now, or do they just teach you a secret handshake? Do you get to put extra letters after your name on your business card? MK: I wish there was a secret handshake — I think I’ll bring that up. As far as the extra letters, I don’t think there is anymore room after the four already there: l.u.s.h. MC: So does membership have its privilege, like better shifts? Can you ignore [Drink bar manager] John Gertsen’s advice now? Must your colleagues now refer to you as Madame Bartender or Queen of the Stick? MK: Queen of the Stick — I like that one! Honestly, it just pushes me to stay on top of my game. Colleagues and coworkers come to me with questions because I’ve taken the course and I want to represent well. So I spend a lot of time with my head in the books reviewing materials and learning more! MC: Any advice for would-be BAR exam takers? MK: Start testing yourself on spirits. It doesn’t necessarily need to be blind, but taste ingredients outside of cocktails. Unfortunately that’s not something most bartenders frequently do unless they deal with purchasing. And read everything you can get your hands on. MC: As a longtime fan of your bartending and hospitality skills, let me say thanks for taking the time to talk with me, and congratulations on your remarkable achievement! Guest blogger MC Slim JB is a Boston-based writer whose restaurant reviews and food/drink features have appeared in Boston Magazine, the Boston Phoenix, stuff@night, and the Weekly Dig. MC is also a frequent contributor to the restaurant review website Chowhound. 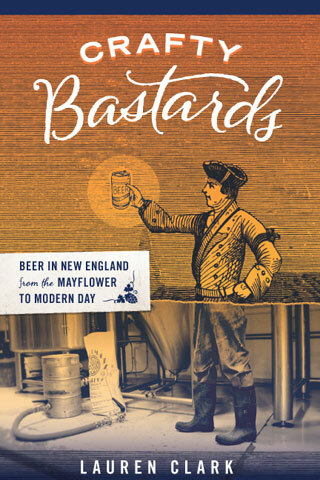 "Lauren Clark takes readers on a supremely sudsy tour of New England ales, lagers, pilsners, and porters. This is the New England the Puritans warned everybody about, but few have chronicled." Stir all ingredients very well over ice and strain into a chilled cocktail glass. ljclark: It totally counts, Cari! A post is a post! ljclark: Of course! Will you be there anytime soon, friend? John of Vienna: Wicked cool. Will there be a book signing up in the Granite State?